I've been on a bit of a clean and simple style kick lately. Maybe it's because the rest of my life is so stinkin' busy all the time, I like to sit down and create projects that give my eyes a clear place to rest. Yes, white space can be beautiful! 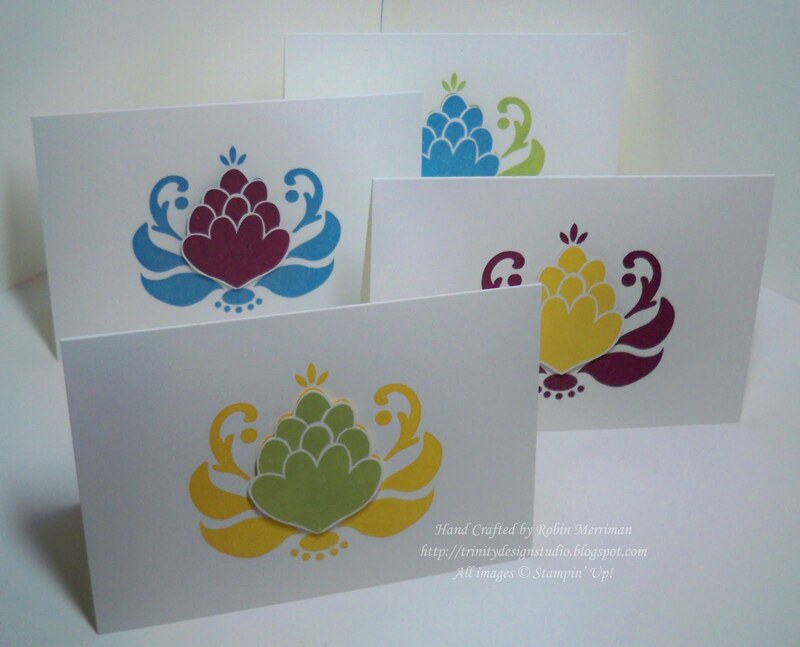 The cards I'm showing you here today are ones that I created back in July for a special event that I demonstrated for. I've been showing these and stamping these for my classes and parties from time to time since then because not only are they lovely, but they are simple and cost effective! All the cards shown here use the Whisper White Note Cards with Envelopes that come 20 to a package in the Stampin' Up! catalog. These are a fantastic bargain at only $5.95 a package. 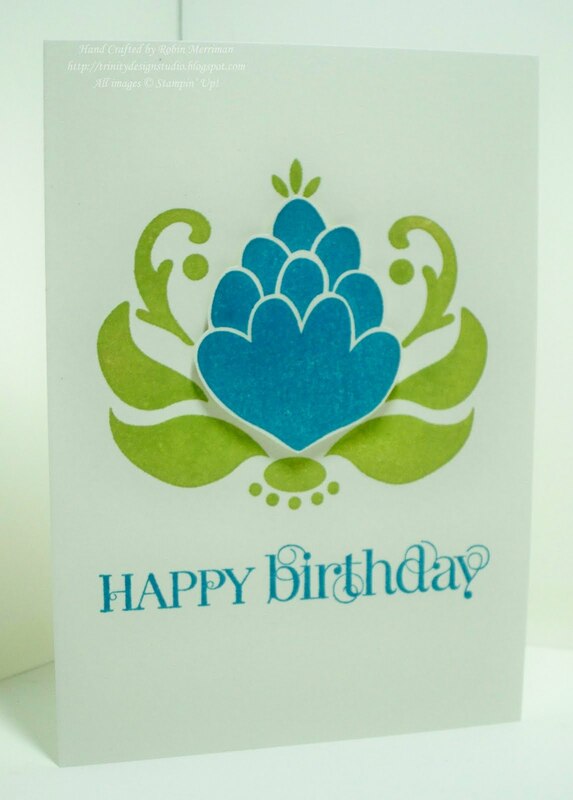 The focal image on each card was stamped with the Ornate Blossom A La Carte stamp (single stamp) which is just $9.95. I've stamped each image with one color, then cleaned my stamp and stamped it again in a different color on a Whisper White scrap piece of cardstock. The center is then trimmed out with my Paper Snips and I popped it up with Stampin' Dimensionals. Believe it or not, that's the only adhesive on the card. Did you know that you get 300 dimensionals in one package? For just $3.95? Yep, another bargain! 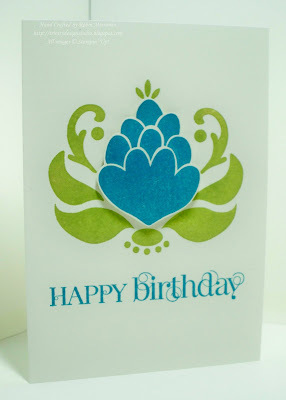 So, one last thing - the colors I used were all from the Getting Started Collection of Stampin' Spots. The spots are 1" square ink pads that come in a color collection. The Getting Started Collection is a cross-sampling from all four of SU! 's great color families, so you get a little bit from each one. I love this color collection and how all the colors mix and match so easily. 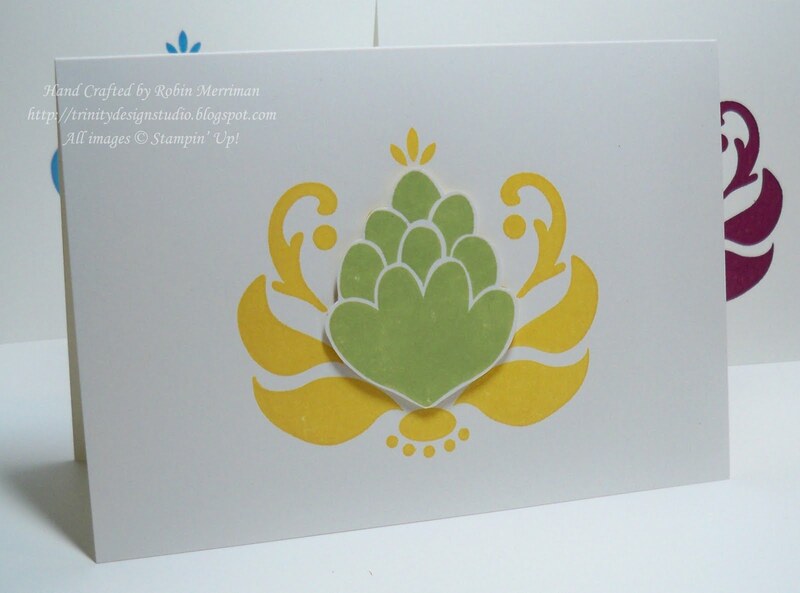 Now if these cards are a bit plain for you, just add some of the new Rhinestone or Pearl Self-Adhesive Jewels. You guessed it - another bargain at just $4.95 for a package of 150! Stamping doesn't have to be expensive, difficult or overwhelming. It can be simple, elegant and cost effective and best of all, it can put a smile on your face as you create something special that is destined to put a smile on someone elses'! Enjoy your day stamping friend! Go stamp something simple and fun!